This camera was made in the early 50s by the Diamond Power Specialty Co. of Lancaster, Ohio. We don't know the model number, but the camera was preceeded by the model 300, which uses octal tubes, and was made in 1950. It uses an image dissector tube, and was made to monitor boilers in power plants. The image dissector had very poor light sensitivity, but it was ideal for high light levels such as the flames inside a boiler. The image dissector tube in this camera was made by Diamond. We have started restoration of the camera. The camera has its own count-down sync generator, with both video and RF output. 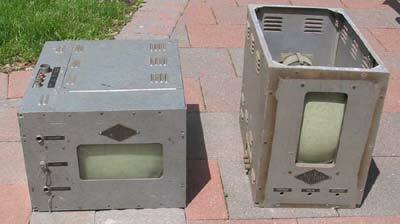 The camera was used with monitors that displayed an unusual aspect ratio. They may have been made to display the size of the viewing aperture on the boiler. 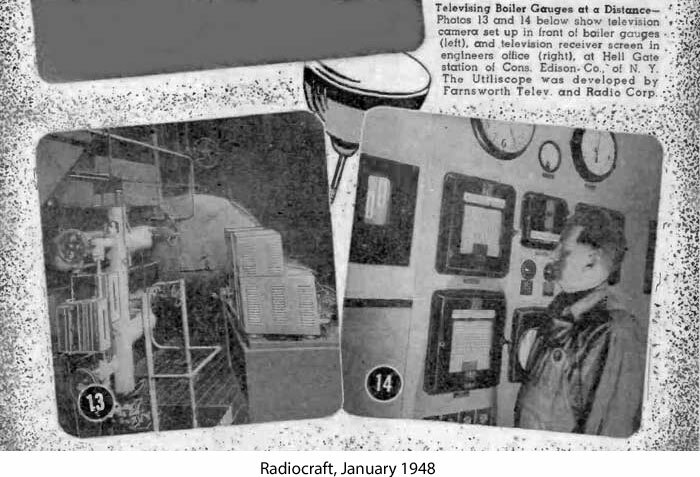 The camera and monitors were donated to the museum by Jean Roundhouse, whose husband Richard was a radio and television engineer in Lancaster and Columbus. Through the generosity of Tom Genova, we were able to acquire an original image dissector tube for this camera. It is named Utilicon, and was made by Diamond Power. This early camera you have pictured was designed by Diamond and manufactured by Diamond up through the 60’s. Diamond started manufacturing the image dissector tube in 1949 or 1950 in our tube lab here in Lancaster Ohio and continued until about 1973 when Diamond power sold our section to Arvin Industries. Arvin did not move the manufacturing of the tube to the new location. We changed the design of the tube in 49 or 50 to bring the socket out the rear instead of the side, this made installing it easier. We hold the patent for the rear socket tube. Also in the mid 50’s we worked on developing vidicons but that never came to production. One of our retired managers has, I believe, two working Farnsworth image dissectors at his home. He may also have one Diamond made image dissector at home. The monitor you have shown was intended to look at a water gauge on the boiler. The aspect ratio was 4:3 but the whole screen was not needed for looking at a gauge that was mounted in the up position. 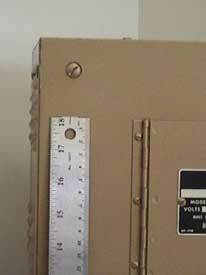 The gauge is about 6 inches wide and close to 2 foot tall. The vertical scan really was rotated by 90 degrees in both camera and monitor so the horizontal was scanning up and down instead of across as we are familiar with in most TV systems. 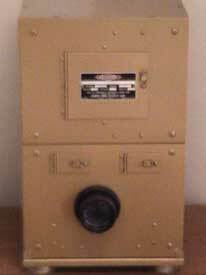 The metal plate on the front covered a round picture tube, if I remember correctly, and the plate was cut to show the part of the image needed in the control room. Water guage viewing was the first application for the camera. We had a crew of 5 including the department manager that made the tubes. As it is remembered we could make about 90 tubes a month which is about 3 per day. 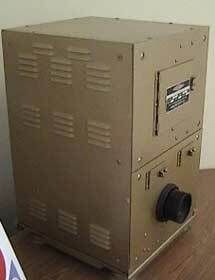 When it was decided to close the tube manufacturing in 1973 we had a rash of orders totaling about 300 so the Utiliscope was still an active product in our customers hands at that time. Most of what we sell today is into the harsh environment as was the Utiliscope. We have on display serial number 5 of an early Farnsworth camera that he made for Diamond around 1946. 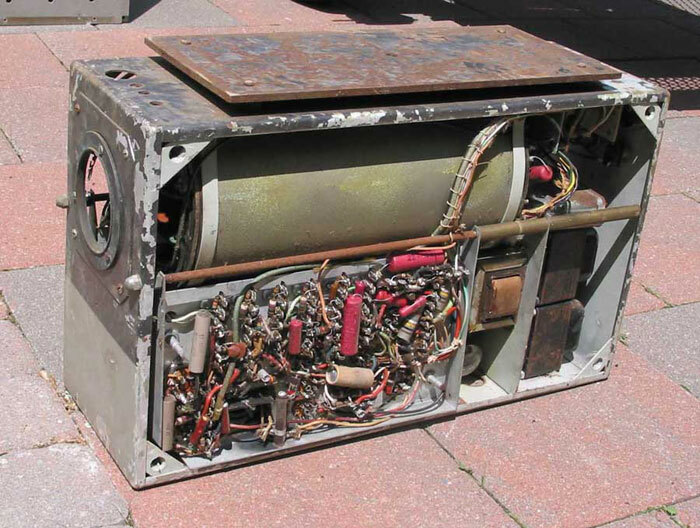 The image Dissector made by Farnsworth had the connecting socket coming out the side. I believe there was an external power supply for the camera.